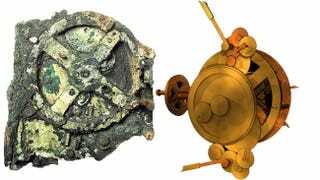 X-rays and advanced photography have uncovered the true complexity of the mysterious Antikythera mechanism, a device so astonishing that its discovery is like finding a functional Buick in medieval Europe. In 1900, some divers found the wreck of a Roman vessel off the Greek island of Antikythera. Among the other treasures remanded to the Greek government was an unassuming corroded lump. Some time later, the lump fell apart, revealing a damaged machine of unknown purpose, with some large gears and many smaller cogs, plus a few engraved words in Greek. Early studies suggested it was some type of astronomical time-keeping device – researcher Derek J. de Solla Price laid the groundwork by establishing initial tooth counts and suggesting that the device followed the Metonic cycle, a 235-month pattern commonly used to predict eclipses in the ancient world. The full function and beauty of the Antikythera device remained hidden until recent studies subjected it to more advanced imaging techniques. First, it was photographed using a technique that exposed the surfaces to varying lighting patterns. This created different levels of contrast that allowed the researchers to read far more of the inscribed Greek text than was previously possible. Then, x-ray imaging was used to create full 3-D computer models of the mechanism, which revealed for the first time some of the more complex and detailed gear interactions. The Greek National Archaeological Museum's discovery of some boxes filled with 82 additional mechanism fragments added new information as well. The findings, published in Nature, are probably best described as "mind blowing." Devices with this level of complexity were not seen again for almost 1,500 years, and the Antikythera mechanism's compactness actually bests the later designs. Probably built around 150 B.C., the Antikythera mechanism can perform a number of functions just by turning a crank on the side. Using nothing but an ingenious system of gears, the mechanism could be used to predict the month, day and hour of an eclipse, and even accounted for leap years. It could also predict the positions of the sun and moon against the zodiac, and has a gear train that turns a black and white stone to show the moon's phase on a given date. It is possible that it could also show the astronomical positions of the planets known to the ancients: Mercury, Venus, Mars, Jupiter and Saturn. The Antikythera mechanism wasn't just a scientific tool – it also had a social purpose. The Greeks held major athletic competitions (such as the Olympics) every two or four years. A small dial within the Metonic dial showed the dates of these important events. The true genius of the mechanism goes beyond even the complex calculations and craftsmanship of a mechanical calendar. For example, the ancients didn't know that the moon has an elliptical orbit, so they didn't know why it sometimes slowed or sped up as it moved through the zodiac. The mechanism's creator used epicyclic gears, also known as planetary gears, with a "pin-and-slot" mechanism that mimicked this apparent shifting in the moon's movement. This use of epicyclic gears is far ahead of what anyone suspected ancient technology was capable of. Scientific American has a two-part video about the mechanism and the imaging techniques used in the research. The mystery of who built the Antikythera mechanism remains. It has been linked to renowned ancient inventor Archimedes by the writings of Cicero, but this particular device was built after Archimedes' death. Still, the engraved words revealed by the new photos pinpoint the device's origin to Corinth, or possibly Corinthian colonies. Sicily was such a colony, and the Sicilian city of Syracuse was Archimedes' headquarters. The researchers theorize that the Antikythera mechanism is based on an Archimedian design, and might even have been built by a workshop carrying on his technological tradition. But if the design has been "industrialized" in such a way, why have we never found another one like it? Mysteries remain. The complexity of the mechanism shows that ancient humans were capable of intellectual and engineering feats that boggle our modern minds (and it puts the lie to all those "ancient astronaut" theories). The upheavals of war and natural disasters over 2,000 years have probably caused us to lose many more works and wonders that will never be found. Read the full scientific article in Nature; or find out more in Decoding an Ancient Computer: Greek Technology Tracked the Heavens, at Scientific American. This io9 Flashback originally appeared on io9 in 2010.